	The drawworks of the trailer-mounted mechanical drive is driven by diesel engine and hydraulic transmission box, which has a proper matching and high transmission efficiency. 	These drilling rigs have the following advantages: reasonable structure design, high-integration configuration and they only require a small working space. 	The main unit, drill floor, DP cat walk, generator set, pump set, solid control system, and auxiliary system of this kind rig can all be transported and moved by trailers. 	The drawworks is a double--drum type. The hydraulic disc brake is used as the main brake and water cooling thrust plate pneumatic brake or FDWS brake is used as the auxiliary brake. 	The mast is front-open type, which has a twin-body structure with an inclination angle mode or erective mode and can be raised or laid down and telescoped hydraulically. 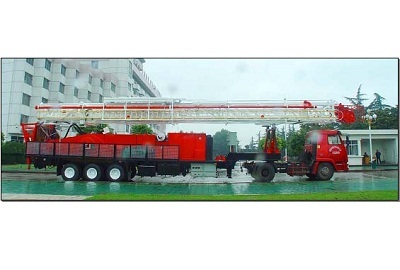 	The drill floor has a two-section telescopic structure or parallelogram structure for easy transportation and lifting. 	The mast of the drilling rig without ground anchor is front-open, triple-section and front-inclination type with a height of 154ft, and it can perform triple-setback (columns) round-trip operations. The guyline is fixed on the drilling rig body, which saves disassembly and assembly time and reduces labor intensity.